There are many people that question whether or not there is a God. They wonder how God, if there is one, could allow things that go on in the world. They don't understand that God has given us free will and he can't make us choose to go down the right path. He never leaves us or forsakes us. He is always there trying to get us to follow Him. God is constantly pulling on our heart strings so that we will give into Him. He puts us in certain situations hoping that we will see Him as the only way out. God's intention is to NOT lose a single one of us. A little over a week ago, I went to West Virginia for my grandmother's funeral. It was a very sad time as you can imagine. It was a big pill to swallow for me. I just went through the death of my dad back in August. My dad's death really took a toll on my soul and my heart. I still have not even began to process it and I don't think that I will ever be able to "deal" with it. On the way back from West Virginia, we decided to stop off and do a little site seeing. We thought it would break up the rush of hard, heavy feelings we were dealing with. To be completely honest, I lost my way a little when my dad died. It took a lot out of me and it left me feeling very empty inside. When I gazed upon the wonder that we saw, it brought up a lot of new feelings. I started to feel warm inside. I felt a warm rush of comfort come over me. I felt God wrap His loving arms around me. I was staring at a natural landmark that man had nothing to do with. I was looking at what I thought should be one of the 7 wonders of the world. It was the most natural and most beautiful display of nature and miracles I have ever seen in my life. What God had made many, many years before man ever set foot on the earth was still taking the breath of people today. It really made me take a step back and think about the goodness of God. It made me think about how His perfect planning cannot be matched. He planned that very moment for me long before the world existed. He knew that by visiting this great landmark, I would feel restoration and caption in my heart of hearts. He refreshed me and picked me back up. He set me back on my feet that day after the death of my dad, my friend, had knocked me down. He did what no man can do. He filled a void that no man could ever fill. What was this great piece of history, of earth, and of God that brought me back to where I am? 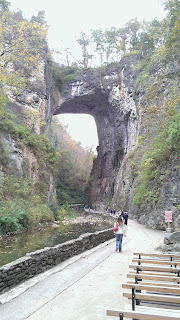 It was the Natural Bridge. If you know anyone that thinks there is not a God, that He does not exist, then please take them to see this magnificent site. I don't believe that anyone can see this landmark in person and not walk away changed in some way. It's just something that will blow your mind. It is something that makes you wonder how all this can be. It really takes your mind back to simplicity. It makes you realize that there is truly one Almighty, Sovereign God. He is the I am. He is Lord of Lords. God is the only being that could have made this picture perfect scene. There is no one or nothing else that could have chiseled this amazing creation other than the God I serve. Until you know God, you don't understand why you live.